While each of these legislators may claim to stand for our families, our communities, and public health, their financial disclosures say otherwise. 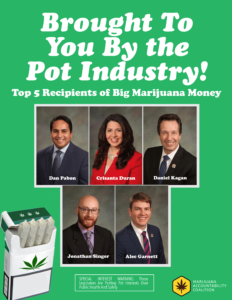 How can they possibly objectively weigh in on what is best for our community when they are being showered in special interest money from Big Marijuana? “As a Coloradan, a parent, and a public health advocate, it is disturbing to see our state’s leaders succumb to big industry’s deep pockets,” said Justin Luke Riley, founder of The MAC. “This grotesque example of corrupt and conflicted leaders is why The MAC exists,” Riley continued.